It can be used over a multitude of surfaces and RAPTOR tintable can be tinted to any colour of your choice, with the ability to create both smooth and textured finishes. 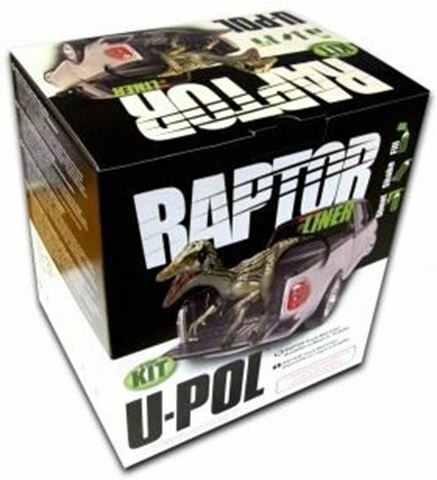 RAPTOR is used for 4x4, automotive restoration, off-road, marine, agricultural machinery and general industry. The polyurethane 2 pack formulation provides a durable and highly resistant surface which will protect against rust, corrosion, salt, moisture and aggressive solutions like animal urine, even in extreme climates. This will restore the most damaged and uneven surfaces to a good as new pristine finish. Once applied, it will dry rapidly to give a scratch, stain and U.V. resistant durable surface. Other benefits include good adhesion, waterproofing, and flexibility. It will also deaden sound and vibrations. This product is remarkably easy to use. To give different finishes, it can be applied using a brush, roller, Schutz gun or even a conventional spray gun. Simply add the hardener to the base material in the bottle and you are ready: Fill - Shake - Shoot. Kits contain 4 x 750ml bottles of base and 1 x 1L of hardener.